Traveling North on the 5 Freeway: Exit at the First Street/Fourth Street off ramp. Stay in the left hand lane (First Street) and it will curve over the freeway and drop you off at First Street (DO NOT TURN ONTO FIRST STREET). 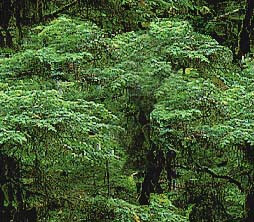 Go straight for 1½ blocks. You will run into Chestnut Avenue, and the Zoo parking lot will be on the left hand corner. Traveling South on the 5 Freeway: Exit at the Fourth Street off ramp. At the end of the off ramp, continue straight for 2½ blocks (DO NOT TURN ONTO FOURTH STREET OR ONTO FIRST STREET). You will run into Chestnut Avenue, and the Zoo parking lot will be on the left hand corner. Traveling North on the 55 Freeway: Coming from Costa Mesa area, take 55 freeway to the 5 Freeway, North toward Los Angeles. Make sure not to use the carpool lane or you will miss the transition. Exit at First Street. Cross First and continue on Elk Lane until you run into Chestnut Avenue. The Zoo will be on your left as you come up to Chestnut Avenue. 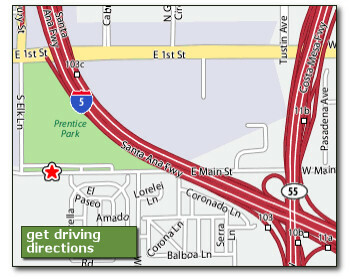 Traveling South on the 55 Freeway: Coming from the Anaheim Hills and Riverside area, take the 55 freeway toward Beach Cities/Costa Mesa and exit at Fourth Street. At the exit make a right onto Fourth and continue on Fourth Street until you get to Cabrillo Park Drive, then make a left. At First Street, make a right and continue on First Street until you reach Elk Ln. and make a left. The Zoo will be on your left as you come up to Chestnut Avenue. Heading East on Route 64: Stop at #5969, which is at the corner of 1st St. & Lyon Ave. Heading West on Route 64: Stop at #5974, which is at the corner of 1st St. & Lyon Ave.
From the Amtrak/Metrolink Station in Santa Ana: The bus route from the Amtrak/Metrolink Station in Santa Ana is #059. To get from the Train Station to the Zoo, go to Dock 10 #6803 at the Train Station and take bus route #059 to Grand/Chestnut stop #6372. From Grand/Chestnut, walk two blocks down Chestnut to the Zoo. To get from the Zoo to the Train Station, walk to Grand/Chestnut and catch bus route #059 at #6347 and get off at the Train Station. 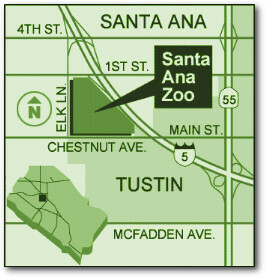 For more information on public transportation to and from the Santa Ana Zoo, visit www.octa.net.